If you ask me ‘Should I apply my Sales Process to every single opportunity?’ my answer would be ‘Yes’. But I would go on to say that you can vary the size. What does that mean? The trouble with a lot of Sales Processes is that they don’t help the sales person win business or are so rigid that they become useless in many real-life situations. A Sales Process which is only applicable in certain situations will not go down well with the sales team. You should have the flexibility to apply a version of your Sales Process that fits the opportunity you are responding to. The Qualification Stage is a key decision point to decide which version of the Sales Process should be used. This should be a carefully considered decision. Applying a light version of your Sales Process in a situation which merits a more advanced one or taking short cuts can result in losing the sale. In theory you can have lots of versions of your Sales Process but I think the maximum for any organisation is 5. More than that and it comes messy and confusing. I have set out a few scenarios below that should help illustrate the sort of variations I see on a regular basis that require different versions of the Sales Process. A high value, complex sale to a new corporate customer who is at the start of their buying journey. In this situation you want to apply the Sales Process in full. A high value, complex sale to the same customer soon after. In this situation you will be able to slim down the Sales Process. You decide to go for a fairly restrictive RFP. Assuming you have fully qualified the opportunity you may have an RFP specific Sales Process. A low value sale to a small or medium-sized business. Lower margins for one off sales means you should have a slimmer Sales Process with simpler versions of the tools. A low value sale to a new corporate customer with great potential for bigger sales later. Apply the full Sales Process. For first meetings, you need to use an Appointment One-Pager and Need-Benefit questioning in every scenario. The Qualification criteria are likely to be different between complex and simpler sales. Individual Value Propositions are only needed when the Buying Center is complex. You should always develop a Deal One Pager to summarize your message and support the customer in internal-selling. Larger opportunities warrant a customer-specific Business Case but you can use example case studies for smaller ones. There is no opportunity that will not benefit from a Negotiation Roadmap and there is no excuse for not conducting loss interviews. If you are dealing with many opportunities you may choose to run a Funnel Review rather than review every opportunity in detail. The more you sell smaller solutions the greater the value to you of a playbook. It involves developing good examples of all the tools of a pitch; Approach email, Appointment One Pager, Need-Benefit Questions, Management Summary, Case Studies and Deal One Pager. You can have playbooks for particular solutions and target industries. The more opportunities you pitch for the more you learn and the better you are able to put valuable content in the playbook making every subsequent pitch a little easier. If you find particular questions get good responses from customers put them in the playbook. And it’s a great place to record all those objection handling responses that have worked in the past. I recently started working with a Private Equity Fund that sells to institutional investors. The sales team were initially very sceptical about the introduction of a Sales Process. One of their challenges was reaching out to the final decision maker. Their main competitor has a stronger brand and fewer challenges in this respect. So we started by introducing Deal One pagers to support customer-internal selling and it works really well. And the CEO finds the Deal One Pager very useful for keeping an eye on what is being proposed to customers. Based on this flexible approach, the Relationship Managers are now open to adopting more elements of the Sales Process. There are many benefits of having all sales people using the same process and tools, even if it varies slightly between types of business. Sales People can work better in teams across organisational or even national borders and people with expertise in a particular sector or solution can easily share best practices. So if you find your Sales Process doesn’t work in the real world, don’t throw it away – make it flexible. 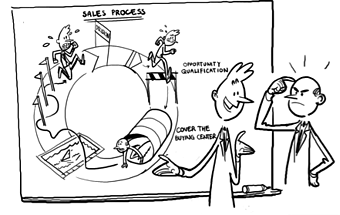 Do your Sales People use the Sales Process properly or just tick the boxes? Does your Sales Process match the real world? Which variations of the Sales Process make sense in your business?